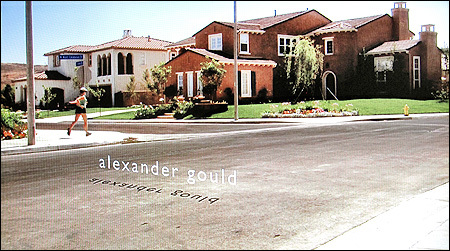 So, where is the main house from "Weeds"? Nancy Botwin's family home? 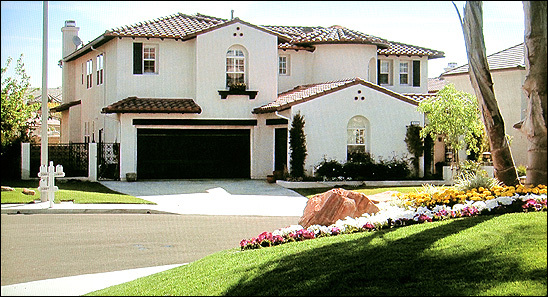 You'll find it at 26885 Chaucer Place, in Stevenson Ranch, CA. about 30 miles northwest of downtown Los Angeles. Here is an aerial photo of the house. Here is a map link. And here is a Google StreetView panorama of the house. knock on their door, or do anything else that might disturb the residents! which then morphs into an aerial photo of the same area. What we see is the map of a very real suburb. But ironically, it's not the same suburb where you'll find Nancy's house. This is actually the city of Calabasas, California. looping, U-shaped street that surrounds the neighborhood is Paseo Primario. Here's an actual aerial map of that suburb. featuring a sign and fountain. The name may be fake, but that sign/fountain is very real. 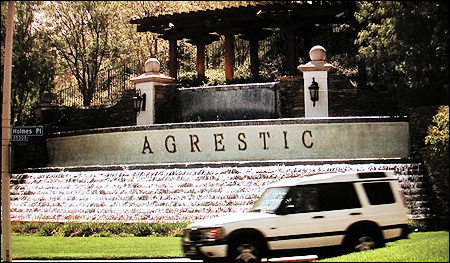 And as you might expect, the sign really reads "Stevenson Ranch", not "Agrestic". Here is an aerial photo of the fountain/sign. Here is a map view. And here is a matching Google StreetView panorama. 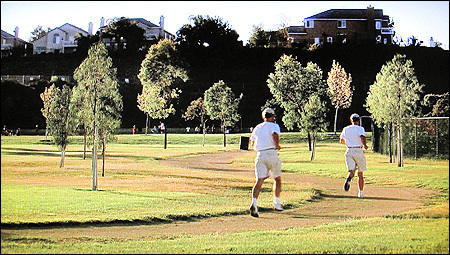 Next, we see a shot of guys jogging in a park - with houses up on a hill behind them. near the center of the Stevenson Ranch neighborhood. 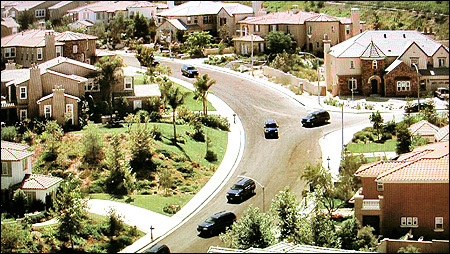 and the street address is 26233 Faulkner Drive, Stevenson Ranch, CA. in the Antelope Valley, which, given the plot of this show, seems appropriate. Clifton Place, which means the camera is looking west/northwest. Here is an aerial photo of the park. And here's a map link. 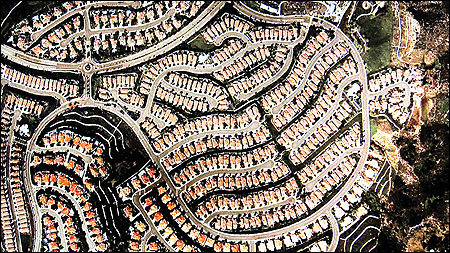 Next, we look down on a suburban street, where the houses have red-tile roofs. The camera is looking northeast up Singer Place. Here is an aerial photo of both locations. And here's a Google StreetView panorama matching that first shot. 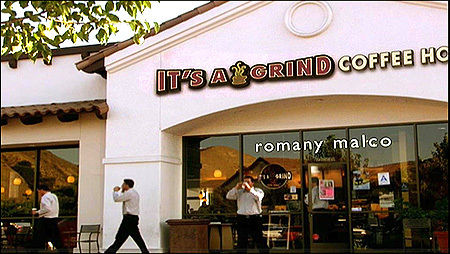 "It's a Grind Coffee House". bother Googling the name, because this isn't one of them. This is actually a Starbucks, located at 26531 Agoura Road, in Calabasas. of the Ventura Freeway. at Las Virgenes & Agoura Roads. That's about 2 1/2 miles west of that suburb shown in that opening map. Here's an aerial photo of the shop. And here's a map link. converging on a semi-circular street, like so many ants. But this time the houses are a little fancier than the ones we've seen before. but they didn't shoot it in that map-suburb either. smaller street (feeding it a mini-van) is Provence Drive. northwest of that original map-suburb. Here's an aerial photo of that intersection. And here's a map link. Finally, we see several female joggers running on a suburban street. 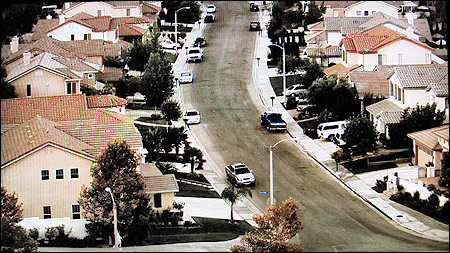 This was shot in the same neighborhood as the mini-van shot. but this time it's about 250 yards farther south, at Lyon Court. Here is an aerial photo. And here is a map link.